President Donald Trump and Republicans are losing the messaging war on the government shutdown. The shutdown is now the longest in U.S. history, entering its 23rd day, and there appears to be no end in sight. As Trump repeatedly declares he won’t reopen the government unless he gets funding for his border wall, House Speaker Nancy Pelosi (D-Calif.) and Senate Minority Leader Chuck Schumer (D-N.Y.) are adamant that they will not fund the project. Trump’s message on the shutdown — blaming Democrats for refusing to concede on his border wall — isn’t convincing the American public. Instead, the majority of Americans think Trump and Republicans are at fault for the shutdown, according to two new polls. 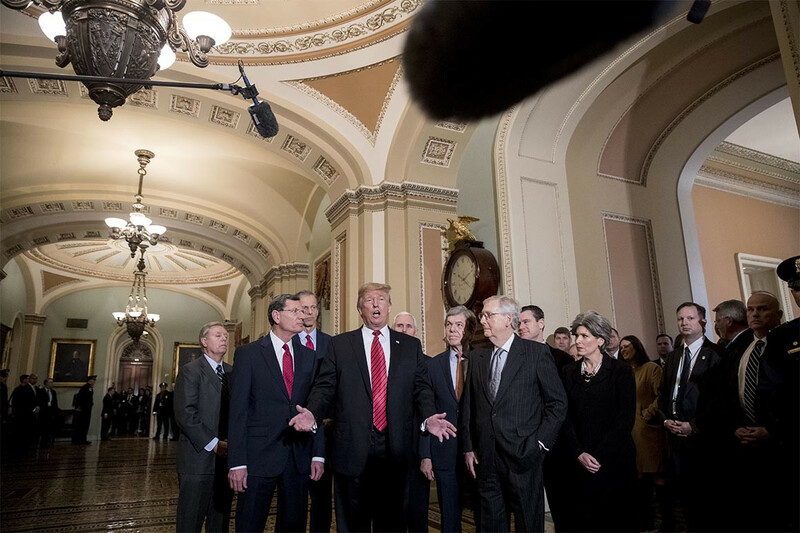 A Washington Post-ABC News found that 53 percent of respondents blamed Trump and Republicans in Congress for the shutdown, while 29 percent blamed Democrats. Thirteen percent of respondents said both sides were equally to blame. Another poll from CNN found that 55 percent of respondents blamed Trump, while 32 percent blamed Democrats. Nine percent blamed both sides. Trump’s disapproval ratings are also rising, with the CNN poll showing his overall rating getting worse by 5 percentage points since the shutdown started. With Democrats refusing to approve any money for the wall — while insisting Trump reopen the government even while negotiations continue — Hill Republicans are now trapped in a situation where their lead messenger’s appeal is designed for base voters and isn’t speaking to the broader American public. Yet in what could be a troubling omen for any deal to end the stalemate, Trump’s message on the wall is growing more popular with Republicans, according to both polls. That means that while the broader American public doesn’t like what it’s hearing from the White House, GOP voters do. Thus, crossing the aisle and voting with Democrats may become even harder for wobbly Republicans who want to reopen the government. So far, only a dozen House Republicans have done so, as well as three GOP senators. Despite the bad poll numbers, Trump isn’t showing any signs of giving in, even as some of the 800,000 federal employees hit by the shutdown have had to go to food banks to eat, begun driving for Uber, or even selling household goods online to pay their bills. The president took to Twitter on Saturday to blast news reports that the White House doesn’t have a plan to end the government shutdown. In a Fox News interview with Jeanine Pirro on Saturday, Trump said that he was waiting on Democrats before he would declare a national emergency. “I have the absolute right to call a national emergency,” he said. “I’d rather see that Democrats come back from their vacation and act. They’re not acting and they’re the ones that are holding it up. It would take me 15 minutes to get a deal done and everybody could go back to work, but I’d like to see them act responsibly. Trump added that he has not left the White House “in months,” despite a trip last week to the southern border. If there is a strategy, it’s unclear what that is. Sen. Lindsey Graham (R-S.C.) told Fox News’ Chris Wallace on Sunday that he advised Trump to temporarily reopen the government for three weeks and try to negotiate with Democrats. If those talks fail, Graham said Trump could then declare a national emergency. But the president reiterated wants to make a deal on the wall, before re-opening the government, according to Graham. House Minority Leader Kevin McCarthy (R-Calif.) also defended the president Sunday and blamed Democrats for being unwilling to compromise. Democrats stuck by their position that Trump and Republicans should allow the government to reopen first, then try to reach an accord on the border wall.